On my way home from Boston last week, my travel mate and culinary cohort was complaining that her daughter wanted the same sweet potato pie again this year, which just quells my friend’s adventurous spirit in the kitchen. She adores trying new recipes and happily accepts defeat if it turns out poorly. To her, half the fun is in the process. 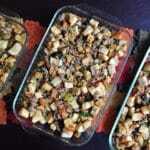 In our home, the immovable Thanksgiving tradition is the stuffing. I’ve already been “told” (in a helpful kind of way) that if my broken foot would prevent me from making the expected stuffing, my SIL would step in because it just won’t be Thanksgiving without it. But at the same time, we’ve added some new dishes to the table in the last few years, recipes that are now indelibly etched in our ever-evolving Thanksgiving tradition. 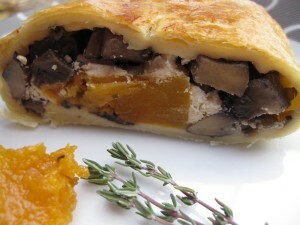 Vegetable Wellingtons to satisfy an expanding family that now includes some pescatarians (fish only, no meat). 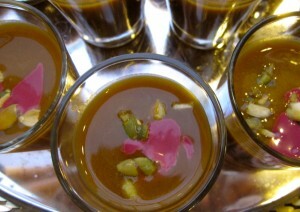 And last year we added soup shooters as a stand-up first course – a surprise for our guests enjoyed by all! Pictured is a pumpkin soup with cranberry creme fraiche – a Bobby Flay recipe. 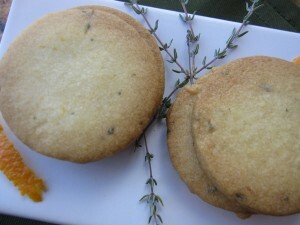 And I also experimented with a savory cookie appetizer served with a complementary cocktail – fun fun fun! I haven’t actually served this at Thanksgiving but if you want to wow your guests or your host, try Dorie Greenspan’s Pumpkin Stuffed with Everything Good. It’s a beautiful addition to the buffet and a mighty tasty and flexible side dish as well. 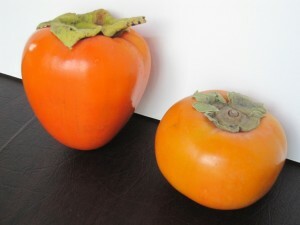 My new adventure this year started with a bowl of hachiya persimmons gifted to me from my friend @yumivore. After learning the difference between hachiya and fuyu persimmons — fuyu (the short squat persimmon) is eaten like an apple, hachiya become soft and the pulp becomes suitable for baking — I researched the myriad possibilities and decided to make a variation on James Beard’s famous persimmon bread. After taste-testing a mini-loaf and gathering feedback from family and neighbors, I’ve tucked a large loaf away in the freezer for use on Thanksgiving day. I’m guessing it will be a lovely addition to the buffet – providing complementary flavors to the rich, sweet, and savory aromas of the day. Traditions start somewhere, sometime – how about starting one right in your own kitchen this Thanksgiving?! What’s your favorite must-have dish at the Thanksgiving table and what would you change if your family would let you? This is a boozy, moist bread with deep luscious fall color and flavors. Here’s a quick run-down of how I modified James Beard’s recipe. I used 2 cups of white whole wheat flour and 1 ½ cups of unbleached flour instead of 3 ½ cups of one kind of flour; instead of one teaspoon of nutmeg, I used ¼ tsp nutmeg, ¼ tsp ground cardamom, ¼ tsp. allspice, and a generous ¼ tsp of cinnamon. I was also out of my regular organic sugar so I used 1 ½ cups of Coconut Palm Sugar and ½ cup of organic. I used less raisins and nuts than called for plus I soaked the raisins in some warm orange juice and cinnamon before adding to the mix. The next time I bake it – I would add more raisins (loved how they tasted) and might back off on the cognac to ½ cup from 2/3 to make it a little more friendly for the young crowd (not that they didn’t eat and enjoy it anyhow). I also grated about 1/2 tablespoon of orange zest into the sugar and rubbed it in to incorporate the flavor, before I added the sugar to the flour mixture. Extract the pulp from the hachiya persimmons: Wash them, cut them in half through the equator, and just scoop out the pulp with a spoon. You can puree the pulp in a blender or food processor - I like it a bit chunky so I just used a hand potato masher. If you need to toast your nuts, start that process now as well as macerating the raisins if you plan to add this step. If you macerate the raisins - just add enough orange juice to immerse them and about a tsp. of cinnamon - pour out most of the juice before you use them. 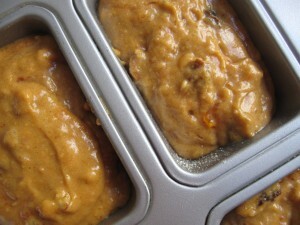 Butter 2 loaf pans. Line the bottoms with a piece of parchment paper or dust with flour and tap out any excess. (I used one loaf pan and one 8 compartment mini-loaf pan. 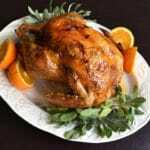 Make a well in the center then stir in the butter, eggs, liquor, persimmon puree then the nuts and raisins. 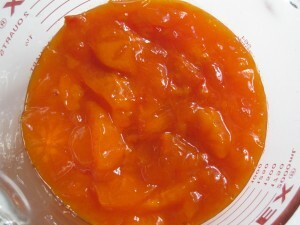 **I removed the pulp from 17 persimmons which yielded 4 cups of pulp - I froze the other 2 cups in one cup containers for later use. Our family love their traditional Thanksgiving stuffing, too! 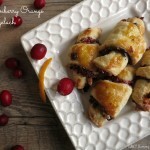 I need to look at the appetizer cookie post…I’m intrigued! 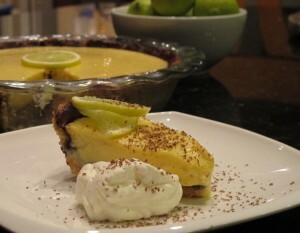 Thanks for stopping by Lemon Drop Pie on my SITS day! Wow! everything looks scrumptious and so creative. I haven’t heard any of these ideas before! Thanks for stopping by Angi – maybe it will inspire you to create a new tradition this holiday season too! Our must have is stuffing. Over the years it has changed very little. When we first got married my husband asked if the stuffing could be mystery meat free. I found out that mystery meat was every internal organ (heart, giblets, and liver) cooked, chopped and added to the mix. I asked him what he wanted and he said bread, onions, and mushrooms. That is easy! This year one of my daughters and I needed gluten-free bread and dairy free margarine. I made two batches of stuffing. They were both successes. Thanks for the beautiful post with all the photographs. Thanks for stopping by and sharing your favorites! 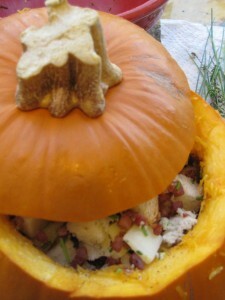 Next year I’ll have to share my stuffing recipe – as it is really my favorite dish if I have to choose. I’ve morphed a recipe from two different recipes and it’s a keeper. Some things are hard to change – especially when you only eat them once a year! 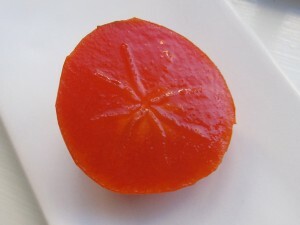 Now this sounds enticing…I’ve never eaten a persimmon before, much less baked with one. This bread looks like a wonderful new tradition! And you have a marvelous selection of dishes here, too. Have you read Michael Chabon’s article in BA? 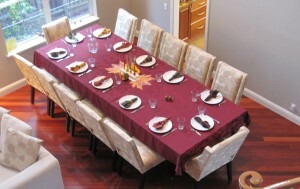 http://www.bonappetit.com/blogsandforums/blogs/badaily/2012/10/michael-chabon-thanksgiving.html Interesting how we all have different views of what is traditional/meaningful. I have some dishes that must be on table – the same stuffing and pumpkin pie – but my family is open to various sweet potatoes or green veggies. With all the amazing experimenting and creating you do, I can’t believe I tried something before you! 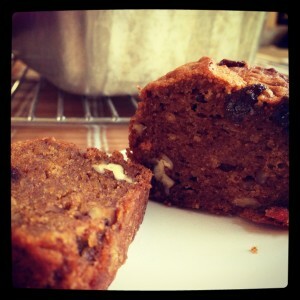 This is the first time I have baked or eaten persimmons – they are fun and each variety is so different. I find their color to be almost more enticing than the flavor. Just gorgeous! 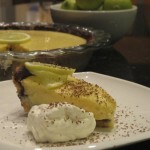 I will head over to read that article for a break from blogging and cooking in a little while. I find it fascinating how traditions evolve and how important they become to us. Have a happy and peaceful Thanksgiving Hannah! Will definitely have to try your bread recipe – sounds so good. I’ve also made cookies with the hachiyas. I buy a case of the fuyus every year; one of my absolute favorite fruits! Happy Thanksgiving!! 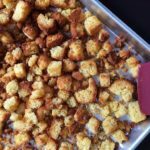 I did freeze some – now that Gail Dosik has suggested making bread pudding with it – I think I’ll have to make another batch! I loved your Thanksgiving post as well – beautiful ghosts! For some reason, I want to use this bread to make a persimmon bread pudding. LOL – you can lily gild all you want – it’s a brilliant idea. This would lend itself beautifully to a bread pudding. I also think you could get creative with what liqueur you use in the bread/pudding. I have an orange-based liqueur from Mexico called 43 that would be fantastic I think. Thanks for stopping by Gail – hope all is well post-Sandy for you in New York. Me neither, until this year. Then once I purchased them at the Farmer’s Market, my friend gave me a big bag of the hachiya and I felt compelled to get creative! The fuyus are great for eating raw or adding to salads and the hachiyas are lovely once they are super soft. They sweeten up and are great for baking or perhaps a smoothie. Try them, you’ll like them! Such a pretty post, Beth. Love all of the great menu ideas! 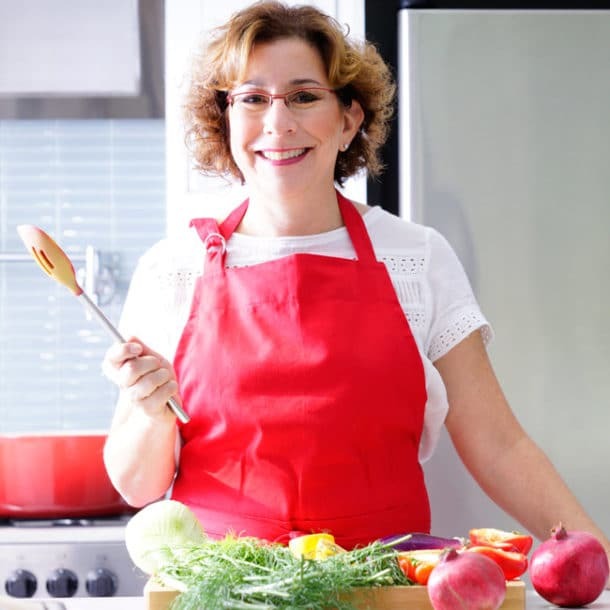 Thanks Carol – writing these posts is such a good motivator for menu planning! With my foot well on the road to recovery, I’m getting excited for the big day.